The Compact Infrared Imager and Radiometer (CIIR) is an Earth observation instrument that is tightly integrated into a 6U CubeSat spacecraft. CubeSats are modular systems of standard 10 x 10 x 10 cm cubes and launch adapter. This allows them to be included as additional payloads if the primary customer for a launch vehicle leaves spare capacity, providing access to space at significantly lower cost than traditional Earth Observation satellites. This proposal will develop a new modular, compact imaging radiometer, the CIIR, Integrate it into a 6U CubeSat with supporting sub-systems and test and calibrate the instrument and integrated spacecraft to a flight readiness level. The spacecraft will be designed for both nadir viewing and scanning of the Earth’s limb, preferably from a Sun synchronous orbit. The filter bandpasses in the CIIR will be targeted to support investigations of the properties of clouds and aerosols and also monitor concentrations of stratospheric water vapour. The CIIR/CubeSat combination will provide a proof of concept for future missions based on low cost, constellations of spacecraft allow multiple local times to be sampled. 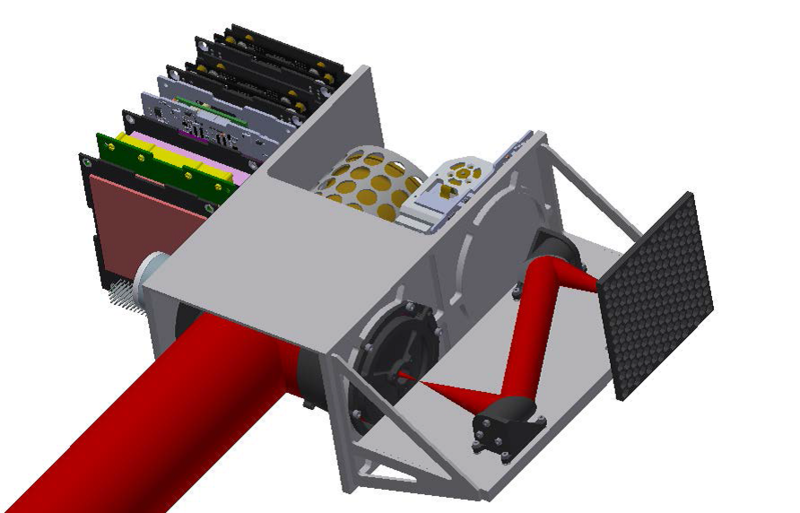 The CIIR concept (Figure 1) builds on the design heritage of the Compact Modular Sounder (CMS) instrument currently flying on TechDemoSat-1 and adapts it to work on a CubeSat. CIIR includes two components to ensure it returns data that can reliably compliment and enhance existing Earth observation data sets. Firstly, it includes a traceable radiometric calibration target to guarantee accuracy of <0.2K. Secondly it incorporates an intermediate focus between the input telescope and detector array; this allows a large (>10) number of discrete spectral channels to be used. Finally, the instrument uses an uncooled microbolometer array to combine medium resolution imaging with atmospheric sounding. Scientifically useful data on stratospheric aerosol are achievable with the baseline design. Trace gas abundances such as water vapour and ozone are more challenging using existing infrared filter designs, but further optimisation is possible. A significant additional source of error in limb sounding is the pointing performance of the platform, this is limiting the ability to retrieve trace gas abundances but technology development is rapid and we expect this project to result in improvements in this area. Nadir viewing at moderate spatial resolution (~150 m) is achievable in the thermal-IR. The integrated CubeSat/instrument concept is viable for low cost Earth system science where global coverage is a requirement.